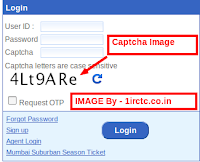 Captcha image given by irctc website on the login page, specially during tatkal timings is getting smaller and difficult to read. As a result users are not able to login promptly and those precious seconds are lost which enable one to book tatkal tickets successfully. Usually a tatkal ticket booked under 20 seconds stands a good chance to success. CAPTCHA stands for "Completely Automated Public Turing test to tell Computers and Humans Apart". It is one of the best methods to stop people using the official website unfairly. Agents started using computer programs which allegedly booked hundreds of tickets within seconds of tatkal opening time. Finally irctc website decided to implement this method, so that such agents don't get the extra edge over common people. Though captcha image used in the railway website very clear and simple, it has been observed that character L in small, I in capital, and certain other characters when presented in waved and line crossed format are pretty hard to configure. For example this captcha to the right is quite difficult to comprehend. Given the fact that seconds matter for tatkal booking, one error in captcha and your chances for getting a tatkal ticket for the next day gets messed up. 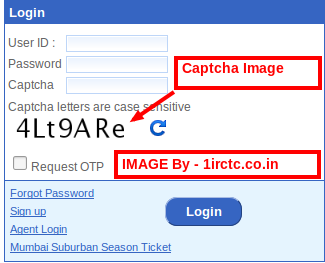 IRCTC has started this trend of using typical captcha images to slow down net traffic and allow normal window reservations to succeed. The best way to overcome this delay is to login at least 15 minutes before the scheduled tatkal opening time to overcome login failures due to captcha images. At this time the images are simple and one has plenty of time to try and retry. Do not install any plugin in firefox or chrome which claim to bypass this system. Such plugins/softwares take more time than the manual entry, resulting in more delay. Besides these have potential to steal your private data or credit card information. The second captcha challenge that appears at the 'Passenger Information page' is the most critical, because other information can be auto filled(refer to my post on how to book tatkal ticket in seconds) but not this captcha. Any error here will surely minimize the chances for a confirmed tatkal ticket. Enter this captcha manually. Don't try any plugin or software because the chances are that the plugin/software will take more time to process the image than the human mind. The error in captcha entry happens because the captcha image is usually very small. Click to make everything on the page larger. You can also use the keyboard shortcuts Ctrl and + (Windows, Linux, and Chrome OS) and ⌘ and + (Mac). Click to make everything smaller. repeat the same procedure accordingly or use shortcuts Ctrl and - (Windows, Linux, and Chrome OS) and ⌘ and - (Mac). To zoom in, increasing the size, press and hold commandCtrl while pressing +. To zoom out, decreasing the size, press and hold commandCtrl while pressing -. To reset size back to normal, press and hold commandCtrl while pressing 0. The difference is clearly visible in this screen shot to the right. After you enter the image text correctly in the text field, return back to normal screen size using the methods described above. WAIT FEW SECONDS: It is always better to wait and let the captcha load, then enter it carefully. There is no use waisting 20-30 seconds by entering the wrong text and doing the same process again. 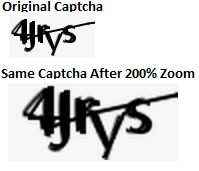 CAPTCHA LENGTH: The complexity and length of the captcha image increases with number of times you arrive at the page in the same login session. So it is better to keep it simple by arriving the passenger details page for the first time during one login session. TIMING and PRACTICE: There is no alternate to good timing and practice. Keep in mind that early login(10-15 minutes before the scheduled tatkal opening time) is ideal. Besides your agility and typing speed matters. Keep all the information at hand like passenger details, aadhaar card number or pnr number, age of the passngers and correct spelling of names. Using firefox such entries can be made using autofill feature. A BLOCK YEAR consists of 4 calendar years. the present block year runs from 2013 to 2017. this can be divided into 2 block years for home town travel concession i.e. – 2013-15 and 2015-17, and concession to travel the HOME TOWN is obtainable twice. Rather than 2 visits to home city/town, the employee is eligible to convert two home town travel concession into ONE ALL India LTC concession. Eligible employees who haven’t availed of the home town travel concession of the 2013-15 year block can utilize it in 2015-17, or they can apply for it to be converted to All India LTC and avail LTC twice in one block year. The central govt. employees are eligible to utilize air, ship, rail and road transportation facilities, along with the travel class depending on their designation and eligibility there of. In the year 2010, in order to develop Jammu & Kashmir and North-East Region, it was announced that Central Government employees are eligible to travel to these regions via air from Delhi and Kolkata respectively. It was also announced that the travel expenses could be claimed in advance. Following this announcement, Central Government employees have started travelling via air, along with their families. From the HEADQUARTERS, where they are employed, they have to travel to New Delhi or Kolkata by train and go to Shri Nagar or Gauhati by airplane. This concession is given in two categories, on the basis of grade pay. Those with GP higher than Rs. 4200 and above are eligible to travel from the airport nearest to their work headquarters. Those with GP lesser than Rs. 4200 will have to travel to Delhi or Kolkata by train and continue only the rest of the journey by airplane. These concessions were initially announced for only two years and then extended to 2013. Each BLOCK YEAR can be carried forward to one year, i.e., those who haven’t utilized the facility in 2012-13 BLOCK YEAR can avail of it until December 2014.
rail टिकट कैसे बुक करें?